TICKETS (AUS) (Bay 2006-Stud 2011). 4 wins-2 at 2, STC Phar Lap S., Gr.2. 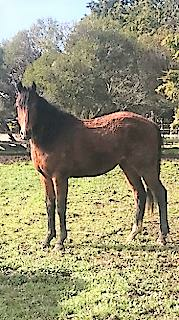 Sire of 165 rnrs, 85 wnrs, inc. Eastender, Lady Hawke, Difficult to Get, Gracious Ryder, Hand it In, Military Forces, Ransom Money, Royal Stamp, Happy Fiery Dragon, Ixcatan, Mr Conductor, Ticketing, Tickets on Her, Concessions, Hold All Tickets, Just Truckin', Mr Tickets, Salesman, Backstage Pass, Elle a Walking, Radiant Girl, See the Show, Space Time, Tickets to Ride, etc. Dabamirak (g. by Green Perfume). 10 wins to 1200m, A$95,090 in Aust. Social Bandit (g. by Bushranger). Placed at 3 in Aust. Umbrella Girl. 20 wins to 1400m to 2018 in Philippines. Sweet and More. Placed at 3 in Macau. Gold Gem. Placed, 2d HKJC Sunflower H., Salt Lake City H.
PHANTOM FLAG - MICHAEL'S CHOICE (H.K.) (Theatrical). 6 wins at 1400m, 1600m, HK$6,529,748, HKJC Stewards' Cup, L, Buckingham Palace H., Silver Lining H., Changchun H., San Miguel Dark Beer H., Salisbury H., 2d HKJC Sha Tin Trophy, L, 3d Hong Kong International Bowl, Gr.2, HKJC Sha Tin 20th Anniversary Cup, 4th HKJC Centenary Cup, L.
REVIVAL RIDGE (Thunder Gulch). 6 wins-1 at 2-from 6f to 9f, Ellis Park Regaey Island S., L, Churchill Downs Allowance. Thunder Gorge. 2 wins at 1m, Goodwood Betting Shops Back Turftv H., 2d Sandown Devine Homes Supporting the Children's Trust H., Wey H., Goodwood Racing UK Nursery H., 3d Ascot DJP International H., Sandown Children's Trust Changing Lives H.
Buscador. 12 wins at 9½f, 12¼f in GB. Fairway Foe. 11 wins from 1m to 11f, US$214,440 in U.S.A.
Miss Monee. Winner at 6f in U.S.A.
Woodleg. Winner at 2400m in Italy. Gray Ice. Winner at 6f in U.S.A.
Astrac Trio. Winner at 2 in GB. GRANNICOLAS (Purge). 4 wins from 1300m to 2000m in Venezuela, Valencia Copa de Oro de Valencia, L, La Rinconada Gran Premio Unicria, 3d La Rinconada Copa Invitacional del Caribe, L, 4th La Rinconada Clasico Jockey Club de Venezuela, L.
CAPITÁN NEGUS (King Seraf). 2 wins at 1400m in Venezuela, La Rinconada Clasico Juan Vicente Tovar, L.
Quick Trick. 3 wins at 5½f, 6f in 2017 in U.S.A.
Little Code. 2 wins at 1m, 8½f in 2018 in U.S.A.
IRISH CONQUEST (Conquistador Cielo). 7 wins to 7f, Gulfstream Park Deputy Minister H., L, 2d Gulfstream Park Sprint Championship H., Gr.3, Calder Kenny Noe Jr H., L, 3d Illinois Derby, Gr.2, Keeneland Lafayette S., Gr.3, Gulfstream Park Dancing Spree H., L, 4th Belmont Dwyer S., Gr.2, Keeneland Commonwealth H., Gr.2-twice. Sire. FAIR MAID (Bates Motel). 5 wins-3 at 2, Louisiana Downs Lady Luck S., L, Trinity Meadows Mrs Claus H., L, 3d Fair Grounds Pontalba S., L, Oaklawn Park Magnolia S., L, Trinity Meadows Ruffian H., L, Willow Park H., L, Sam Houston Park Mom's Command S. Producer. Serrat (Abel Prospect). 2 wins in Peru, 3d Monterrico Clasico Gustavo Prado Heudebert, Gr.2, 4th Monterrico Clasico Mariano Ignacio Prado, Gr.2. NORTH BY SOUTH (Northern Flagship). 3 wins, Detroit Siren S., L, 3d River Downs Rambling Rose S., L. Producer.